The renowned festival Ganesh Chathruthi has arrived and the consumers are already on the verge if buying everything they would need to pray this Elephant-headed God. As this is greatly celebrated in some parts of India, everyone would be taking the advantage of a consumer, from petty retailer to a Marketer. This festival can be called as the most innovative one as people try different things to build Lord Ganesha Idol, from auto spare parts, vegetables, currency notes, dry fruits and what not! Brands even create some contest, publish interesting online videos, engaging blogs and flaunt their creativity in some of the other way to win the heart of the customer. Digital Nest here takes a look around and recognized a few brands which are stepping extra a mile to pitch the customer attention with their interesting activities this year. The leading world’s leading connected consumer lighting system Philips launched a campaign called “Ganesh on Wheels”. These are the mobile with lighting system vans run in the state of Maharashtra covering 30 cities between 3rd September 2018 to 17th September 2018. The main intention of this is to reach more consumers directly to their homes on this special occasion with displaying Ganapati idol enabled by fascinating colour changing lighting effects. To intrigue even more interest, the brand is offering consumers an opportunity to win Philips products through a contest. It is said that the “visitors would snap a selfie with the Philips Ganesh idol and post it in Social Media Account with the hashtag #PhilipsLightingGanesha on social media accounts to win scratch cards with holding amazing prizes”. The Homegrown messenger app Hike thought a bit innovatively and went that extra mile. 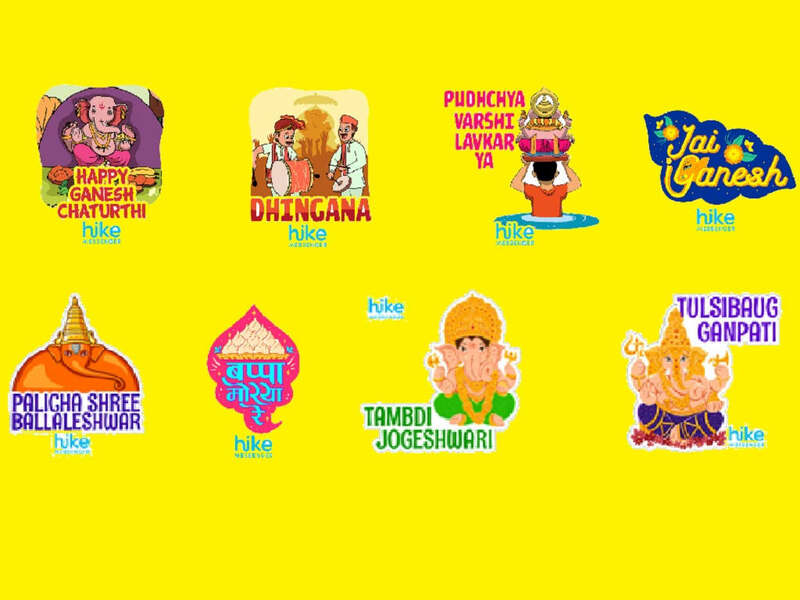 They created 60 stickers related to Ganesh Chaturthi in three languages English, Hindi and Marathi. Those would be available in the app from September 12th available on both Android and iOS. This is to highlight the app and creating awareness among everyone regarding the app. India ’s fourth largest private sector bank has launched a campaign called “More with Morya”. The main intention behind this is to connect with customers more and make them understand how to utilize the capital returns. This launch comes on the auspicious occasion of Vinayaka Chaturthi and is a way for the Bank to provide better and more targeted services to its customers. Snapdeal is creating an awareness campaign named as “Green Ganesh”. It has created a store especially for this Ganesh Chaturthi which displays all the pooja essentials needed for the festival including musical instruments, festive dresses and utensils for the festival which are eco-friendly. There are Ganesh idols which are made of clay that are basically eco-friendly and save the water from the regular Plater of Paris (POP). Amazon is providing great offers with this Ganesh Chaturthi. As this festival is widely celebrated in India, people buy new items and shop online. Amazon took this as an advantage and providing the great offers to reach more customers with profitable deals. Godrej calls out everyone to celebrate this Ganesh Chaturthi with Godrej Nature’s Basket. They offer the tasty goodies and gift hampers that delights everyone. They also introduced converse trolleys to make the visitors space filled with the trolleys as they are a great way to serve visitors. The largest using an app to book tickets Redbus is taking the advantage of this long weekend. Vadodara Traffic police have created a campaign named “BacheBoleMorya”. With the intention of creating the awareness and encouraging people to celebrate the eco-friendly Ganesh Chaturthi and follow traffic rules. They have decided to distribute an eco-friendly Ganesh to everyone with a slogan of traffic rules. Nowadays Brands are the 360 implementations for the business as they help to fetch and generate more ROI. They are taking advantage of every occasion and making it succeed by reaching more customers and creating brand awareness.It is really good to see brands joining the league of festival progress. Digital Nest says kudos to all these brands and wishing their campaigns to get succeed and also wishing everyone a Happy Ganesh Chaturthi!